This week I thought we should take a look at the moving process. This might sound simple, but if you have never moved house before, you probably don’t know what to do to make your move happen. So with that in mind, lets run through a standard moving process from start to finish. 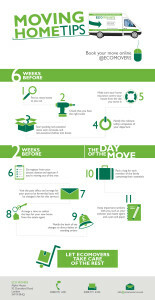 Once you have decided to move, your first step should be to find a moving company. It’s best to get quotes from two or three companies and each one will generally send out an estimator to give you a price based on the quantity of goods that need to be moved. They will also ask you what level of service you want – this can range from you doing all the packing or having the moving company do some or all of it. 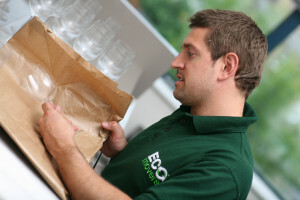 When you have reviewed the quotes and have decided which company you’re going to use, it’s important to check that they have availability for the dates you require. Once you have agreed the dates and signed a contract you can relax for a while, knowing that you have your moving company booked – The first milestone in your moving process is now complete. The next step is to have a good clear-out. There is no point paying a company to move something that you never use so take some time to get rid of old or broken things that you never use. After the clear-out, it is time to start packing. If you have chosen to do the packing yourself, don’t underestimate how long it will take – start early and commence with packing away little-used items first, leaving your everyday items until a few days before the move. Label boxes with a room name or number so that the moving company knows where to put it at the new property. Make sure you keep a bag or suitcase separate, with clothes and other essentials you might need during the move. On the day of the move itself, the moving company will take your packed boxes and furniture to the van. Meanwhile, your main focus should be inspecting the house before you leave, making sure that you have left nothing behind. Double-check all cupboards and any attic space carefully before you leave. Once you get to the new property, put a notice on each room so the moving company knows which boxes go where. It’s also a good idea to designate one person as the primary point of contact for the moving company (should they have any questions or problems while unloading). Once all the boxes and furniture have been unloaded from the lorry and placed in the correct rooms, the moving company will leave and you will be left to acquaint yourself with your new home. My best piece of advice at this point is to get the beds and bed linen unpacked first so that, no matter how much or how little unpacking you manage to do, you can guarantee a comfortable night’s sleep on your first night in your new home!